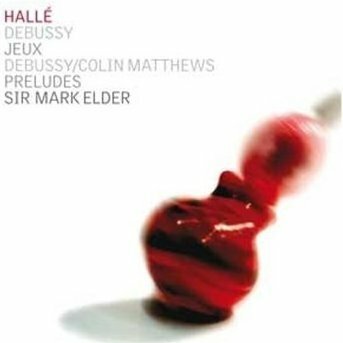 Colin Matthews's orchestrations of Debussy's 24 piano preludes have quite rightly been praised by critics and I certainly won't be contradicting their positive assessment here. However, I would like to question the implicit criteria that has guided their judgement since I think it has blinded them to many of the qualities that make these pieces so interesting. The project has taken Matthews five years to complete, with the Hallé under Mark Elder premiering the preludes as they have appeared. This disc, the companion to an earlier recording which pairs La Mer with the other twelve preludes, then, marks the final phase of a huge undertaking. Contrary to expectation, we do not find Book I on the first disc and Book II on the second, rather they have been spread across both with the order seemingly random. This is not a slight to Debussy who saw the preludes as individual compositions rather than a cycle, and the new order has actually been carefully chosen to ensure some thought-provoking juxtapositions. In the liner notes, Gerald Larner writes 'Matthews has discovered the secret of each piece and in most cases translated it faithfully, if not literally, into orchestral terms.' In a similar vein, a quotation from the Sunday Telegraph on the back cover reads 'they are recreations achieved by entering into the mind and thought of the original composer.' Andrew Clements in the Guardian is also keen to stress that Matthews 'never trespass[es] beyond Debussy's own musical world.' In each case it is respect for the original composer's conception that is taken to be the touchstone of a good transcription. In a few cases Matthews is 'faithful' to the source material, but in many others he significantly alters its character. In Voiles this is done subtly by bringing to the surface and clarifying latent tendencies. Without an article to decide the gender, 'voiles' may refer to sails or veils, an ambiguity Debussy plays with for the whole duration of the piece. By contrast, the variation in orchestration tends to fix the meaning: gently fluttering high woodwind and brooding low strings that suggest the slow progress of a ship through a moonlit night alternate with a more sensuous string sound and harp arpeggiation that brings to mind the secret pleasures waiting behind an Eastern veil. As for Feux d'artifice and La cathédrale engloutie, the effect is quite at odds with the 'thought of the original composer'. In the former, the piano original is about explosive virtuoso fireworks as much as being a representation of the visual-spatial – not aural, it might be added – experience of a firework display. The orchestral version is a glittering, cascading riot of colour, but without the performance aspect it becomes a very different, almost unrecognizable, piece. In the latter, Matthews has used actual bells, created a realistic imitation of a church organ, and topped the whole with bright trumpets that allow the melody to ring out clearly. So, rather than the sounds emerging from the depths of the ocean as I have always imagined in the Debussy, we now see the cathedral exposed at low tide, glistening in the dawn sunlight. In what I find the most remarkable passages, Matthews has achieved an uncanny effect whereby the century that separates us from 'Debussy's own musical world' becomes disturbingly apparent. Hommage à S. Pickwick, Esq., P.P.M.P.C. is an affectionate portrait of the Dickens character by a French anglophile. The opening, in which Debussy uses 'God Save the Queen' to mock the bumptious Victorian businessman, is given to a lazy trombone and tuba with an unconcerned trumpet accompaniment. Matthews thus conveys the supreme indifference that now greets a national anthem drained of all meaning. The arch-organiser Pickwick, shuffling his papers, passing resolutions, ensuring the efficient functioning of the travel club, Debussy characterizes with a busy little melody that Matthews transfers to the clarinets. However, it is sidelined by a weaker countermelody in the strings reminding us of the increasingly intrusive but ineffectual bureaucracy that now infests every corner of our lives. Matthews has defamiliarized and hence distanced the Debussy by, ironically, bringing it closer to our contemporary view of the world. Something similar happens in Des pas sur la neige. Debussy surely meant the trudge through the bleak landscape as a metaphor for the loneliness of the modern city, with the memory of warmer seasons corresponding to a yearning for nature. The haunting melancholy interspersed with occasional dread that Matthews's orchestration brings to the piece simultaneously conveys our greater sense of alienation as well as looking back enviously at Debussy's world. The resulting tortured reflexivity captures that uniquely postmodern experience of nostalgia for an earlier form of nostalgia. These orchestrations, then, are not simply reducible to the source material – in terms of the notes themselves or the ideas behind them – but contain shifts in emphasis, changes of character, and even overlay a contemporary perspective that estranges us from the original works. They are not merely the faithful transcriptions of a skilful orchestrator, but the imaginative responses of a successful orchestral composer whose own distinctive voice makes them worth listening to in their own right.